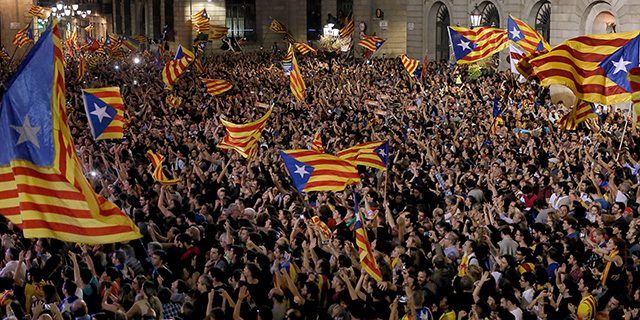 Catalonia’s recent secession attempts come at a difficult time for Spain. Across the country, people distrust the national government and feel dissatisfied with the way democracy is working in their nation. And Catalans are even more negative on these issues than those living in other regions of Spain, according to a new analysis of data from a Pew Research Center survey conducted in March and April. An overwhelming majority of the Spanish public (81%) does not trust the national government to do the right thing for their country. In Catalonia, this figure reaches 91%, including 53% who say they do not trust Madrid at all. In other regions of Spain, 79% lack trust in their government and only about four-in-ten express absolutely no trust. Spanish people are also unhappy about their democracy. Overall, 74% say they are dissatisfied with the way democracy is working in their nation. Among Catalans, this figure is 81%, with 41% saying they are not at all satisfied. While 73% of people living in other regions of Spain are dissatisfied with democracy, only 28% feel this way strongly. Catalonia’s independence referendum has been controversial, but the Spanish public is quite positive on direct democracy in general. Three-quarters believe that a system where citizens, not elected officials, vote directly on major national issues to decide what becomes law would be a good way to govern their country. People living outside of Catalonia are in agreement with their Catalan counterparts on this issue (74% versus 79%, respectively). Catalans and other Spanish people also agree that the nation’s economy is doing badly. Across Spain, 71% hold this view, including two-thirds in Catalonia. One aspect of the debate over the recent referendum is whether Catalonia would benefit economically by breaking away from Spain. Catalonia’s economy consistently outperforms the Spanish economy as a whole. The region accounts for roughly one-fifth of Spain’s gross domestic product (approximately 212 billion euros in 2016) and 16% of the population. Its only rival is the region that is home to Madrid, which accounts for about as much of Spain’s GDP as Catalonia (approximately 211 billion euros in 2016) and 14% of the population. Catalans also enjoy an unemployment rate well below the national average – just 13.2%, compared with 17.2% for Spain as a whole. However, Catalans pay for their relative prosperity in spending imbalances. They pay about 10 billion euros more in taxes than they get back in government spending, a long-term point of contention in Catalonia’s relationship with Spain’s national government.